There are several benefits of a reverse mortgage, such as elimination of your monthly mortgage payment, and getting cash out of your home for anything you might need. 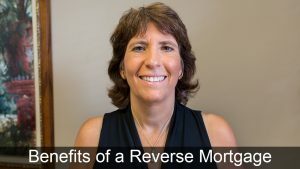 In this video, Mary Catchur covers the most popular benefits of a reverse mortgage, while also telling you about the guidelines to qualify for this type of mortgage. Mary also explains a little-known benefit of reverse mortgages, which is the ability to buy a new home with a mortgage without having to make a mortgage payment. Hello, I’m Mary Catchur. I’m the owner of Marimark Mortgage. Today, I want to talk a little bit about reverse mortgages. A reverse mortgage can be a good financial product for a borrower who’s over 62 years of age who may benefit from eliminating their monthly mortgage payment, or even getting some additional cash that they can use for home renovations and repairs, or just to pay some monthly expenses that they may be having difficulty making. In order to qualify for a reverse mortgage, you do have to have some equity in your home. So it’s best for borrowers who either have no mortgage, or maybe a small mortgage in relation to the value of their home. To determine whether or not you would qualify for a reverse mortgage, the lender will really use your age, because that is what determines how much equity you need to have in the home. The amount of equity that you need to have is based on the age of the borrower. So it varies by borrower, but can be easily determined by your lender just by providing your date of birth. To determine the value of the home, of course an appraisal will need to be done. Some guidelines have changed in recent years to better protect the borrower under the reverse mortgage product. Initially, there was really no financial assessment to determine whether the borrower could continue to make their expenditures for taxes and insurance on the home. But now, they’re doing a financial assessment and they will verify the borrower’s income just to make sure that once they complete the reverse mortgage, that they’re still able to meet their expenses associated with the home. They also will look to make sure that taxes and insurance have been paid on a timely basis over the last two years. All of these things benefit and protect the borrower. Another nice feature of the reverse mortgage is that prior to even beginning the process, the borrower’s required to go to a home counseling session. This can be done by phone, there’s a small charge for it that usually can be covered at closing, but it’s very helpful to the borrower because everything is explained in great detail to them, so they understand the process. I also even recommend that the borrower include their family members in this process so that there’s an understanding of exactly what they’re going to be doing, and no questions later as the family members have to, at some point, possibly pay off the reverse mortgage loan. A reverse mortgage can also be used to purchase a home. A lot of people are not aware of this, but this is a great avenue for somebody who is possibly wanting to downsize, move closer to relatives as they age, or maybe move into a home that’s more equipped for their needs as they age. Again, there is equity required and that usually comes from the sale of the existing home, and then that money is used as the equity to purchase the new home, and then there’s no mortgage payment once that process is complete. If you think that a reverse mortgage would benefit you, please feel free to give us a call at 866-910-8020, or visit us online at MarimarkMortgage.com. We will be happy to discuss your options with you and determine whether a reverse mortgage makes financial sense for you.